A 6-minute workout of Yoga Poses for your Abs will do the same job as killer crunches but without the ‘killer’ part. I used to believe that any form of exercise had to be more than just 6 minutes to be effective. Additionally, I thought the only way to get better abs was to do workout routines that included a massive amount of crunches and planks. ** Warning ** Don’t try these poses without a Yoga Mat! Personally, most of the ab routines I’ve seen are intense and not something I thought I could do. Through the years, I’ve found other exercise workflows that don’t take up as much time as long cardio workouts. Yoga has become my main source of abs workouts, though when I can, I squeeze in some cardio too. A workflow of Yoga poses for Abs could take as little as 6 minutes to get started while also working out those core muscle groups. First, you want to find poses that you feel comfortable trying out in your workout. Some of the poses that have been in my own abs workout include the plank and side plank, though I’ve had to modify them to fit the needs of my joints. From a plank pose, one can simply drop down into the cobra pose. From there, the yogi can raise themselves up into the upward-facing dog pose. Finally, from there, one can easily move into a half-moon pose. 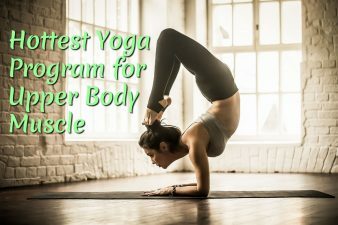 Complete the set 2 or 3 times, hold each pose for at least 30 seconds and that gives the yogi a full 6-minute workflow. This workout should be performed 3-5 times a week to start. The idea of excessive exercise sometimes turns a person away from any type of exercise, myself included. For every workout routine, one must follow their own unique style. Swimming, yoga, and speed-walking for cardio are low-impact and together help keep the body, joints, and muscles functioning smoothly together. Mix all that with a better diet and drinking more water and you will lose that unwanted belly fat. The best part is you don’t need to feel the pain to get to better abs. Press your outer arms inward and firm the bases of your index fingers into the floor. Firm your shoulder blades against your back then spread them away from the spine. Also spread your collarbones away from the sternum. 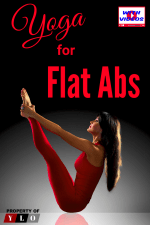 With an exhalation, straighten your legs to a 45-degree angle from the ground, bringing your body into a “V” shape. Spread your shoulder blades wide and reach out through your fingers, actively engaging your hands. Stay in the pose for five breaths, gradually working up to one minute. To release the pose, exhale as you lower your legs and hands to the floor. Stand in Tadasana (Mountain Pose), exhale and fold forward to Uttanasana. From Uttanasana, exhale and step your left foot back into a high lunge position. Your right knee should be more or less at a right angle. Lay the midline of your torso (from the pubis to the sternum) down on the midline of the right thigh (from the knee to the hip crease) and bring your hands to your right knee, right hand to the outer knee, left hand to the inner. Squeeze the knee with your hands, lift your torso slightly, and with an exhalation, turn it slightly to the right. Now from the lunge position, stretch your arms forward, parallel to the floor and parallel to each other, palms facing each other. Exhale and press the head of the right thighbone back and press the heel actively into the floor. Synchronize the straightening of the front leg and the lifting of the back leg. As you lift the back leg, resist by pressing the tailbone into the pelvis. Normally students come up into Virabhadrasana III by lunging the torso forward. This tends to shift the body weight onto the ball of the front foot and unbalance the position. Don’t allow the torso to swing forward as you move into position; instead, as you straighten the front knee, think of pressing the head of the thighbone back. This centers the femur in the hip joint, it grounds the heel into the floor and stabilizes the position. The arms, torso, and raised leg should be positioned relatively parallel to the floor. For many students, the pelvis tends to tilt. Release the hip [of the raised leg] toward the floor until the two hip points are even and parallel to the floor. Energize the back leg and extend it strongly toward the wall behind you; reach just as active in the opposite direction with the arms. Bring the head up slightly and look forward, but be sure not to compress the back of your neck. Stay in this position for 30 seconds to a minute. Release back to the lunge on an exhalation. Bring your hands to the floor on either side of the right foot, and on an exhalation, step your left foot forward to meet your right. Stay in this forward bend for a few breaths, then repeat for the same length of time on the other side. Pose (the top of a push-up): Palms flat, body extended, with your legs reaching through your heels. Beginners can lower their right knee and shin to the mat, keeping their hips lifted while building strength in the arms and torso. Hold for up to 30 seconds. Exhale as you slowly return to Plank Pose, then into Downward-Facing Dog. Repeat on the opposite side.